My quilty friends and I have been joking about making a Rob Peter to Pay Paul(son) quilt in honor of the current economic mess. This saying is an old one. It is commonly thought the phrase came from when King Edward VI ordered St. Peter's church in Westminster to sell some of its land in order to pay for the repair of St. Paul's in London. But it may have been much earlier as it's mentioned in John Wycliffe's "Select English Works" written in 1380. Seems like this robbing Peter to pay Paul sort of thing has been a problem for a very long time. 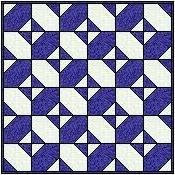 That got me to thinking some of you might enjoy making a Rob Peter to Pay Paul quilt. After all, sometimes you've just got to laugh. There are several different patterns with this name. Based on the popularity of this name for various quilt patterns I suspect this sort of robbing to pay has been going on a lot over the years. I didn't post pictures of all the Rob Peter to Pay Paul blocks as there are so many. Sometimes the Drunkards Path block is given this name. Typically Rob Peter to Pay Paul quilts consists of two opposing colors though I've never been sure which color is robbing or paying which. The example at the top of this page is the most traditional but the curves make it a little tricky. It is also called Orange Peel. 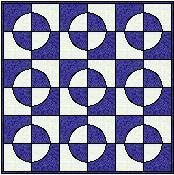 You can find the pattern at Marcia Hohn's site, "The Quilter's Cache". The middle one also involves curves. But the one shown to the left is a quick and easy straight line version. That is the pattern I've drafted for you. You will find the 9 inch by 9 inch template pattern at Template for Rob Peter to Pay Paul. 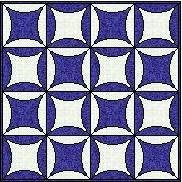 So vent your frustrations with the economy and have fun with this quilt pattern.